Does this Qantas greeting card make no sense… or is it just me? From time to time I check my Gmail which — now that I use PGP and my own hosted mail — has been relegated to the role of receiving email from newsletters, site registrations and other such disposable crap so I don't have to handle it on my primary address. Handle… that's a bit of a pun, as you'll read in a second. Or however long it takes for you to read posts like this, it could very well take longer. Handling. So I was checking my aforementioned junk email account like a good little slave, and I got an electronic Christmas greeting card from Qantas. As with all their electronic communications they never include the intended message, but rather a brief hello proceeded by a link to follow. As 2010 draws to a close, we would like to wish you and your family a wonderful festive season. 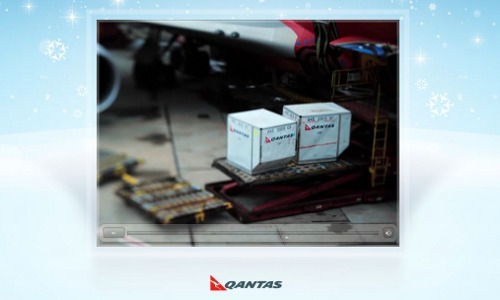 From all of us at Qantas, please enjoy this message as we share the spirit of the season. Clicking the link, I was directed to a festive web page loaded up with… Flash. Making an exception for it in NoScript, the page loaded and I was presented with a perplexing video of a 747 having cargo unloaded, then loaded again. It looks just like any other movie player with a timeline and a pause button. Once the movie had finished, the player faded out and a thank you message appeared. While the latter was touching, I haven't the foggist idea what the video was supposed to be for. There were no Christmas or other holiday images anywhere, no people in fuzzy red and white hats, and despite watching the whole clip in anticipation of a Santa popping out or reindeer being offloaded from cargo pallets… there was nothing. Just a video of baggage handlers and bags being unloaded and loaded from planes. Check out the link for yourself if you so wish, and tell me if I'm missing something. I have no idea what's going on! Well actually I do know what's going on, their marketing department wants me to talk about Qantas. Mission accomplished! Speaking of which, how funny are Trent 900s, I'll bet Rolls Royce aren't getting any confusing Christmas greeting cards from Qantas.